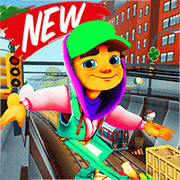 Play Bus & Subway surfers Online For FREE! - Bus & Subway Runner Online is a popular game-Dash as fast as you can through the subway and dodge the oncoming trains. Help Jake, Tricky and the rest of the crew escape from the inspector and his dog!.